these posts through offline mode only from 2-10-2018. The last date for submit the application form is 25-10-2018. The candidates will be selected on the basis of written test and physical tests. The qualification for the constable post is candidates should be passed in 10+2 (Senior Secondary) from recognized University. For more details candidates can refer the website of Mizoram Police is www.Police.Mizoram.gov.in. 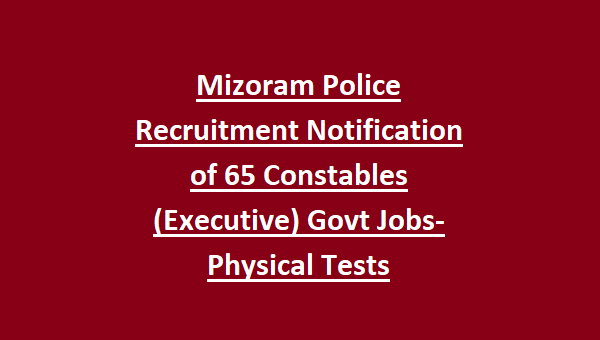 The age limit, salary, physical standards tests, physical efficiency tests and how to apply are given below for the Constable (Executive) male & female posts in Mizoram Police are given below. 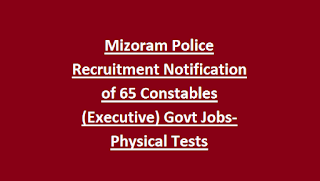 There are total 65 available vacancies for Mizoram Police Constable (Executive)-Male & Female. For Constable Executive (Male) – As on 01-07-2018 the age limit is in Between 18 – 21 years. The upper age relaxation will be 5 years for SC/ST and 3 years for OBC. For Constable Executive (Female) – As on 01-07-2018 the age limit is in Between 18 – 25 years. Male – The upper age relaxation will be 14 years for SC/ST/BL/Primitive Tribe and 6 years for OBC-CL/OBC-SL/UR. Female – The upper age relaxation will be 10 years for SC/ST/BL/Primitive Tribe and 5 years for OBC-CL/OBC-SL/UR. The education qualification for the Constable male & female posts is should passed in 10+2 (Senior Secondary) from recognized board. Candidates can refer in the official website of Mizoram Police for application fee. The candidates will be shortlisted based on physical test and written test. - For all Candidates (except Ex-Servicemen). Candidates who are qualifying in the Physical test eligible for written test. The written test will be comprising of Objective type questions of 100 marks with duration of time is one and half an hour (90 minutes). Interested and eligible candidates can apply for the Mizoram Police Constables (Executive)-Male & female through offline mode only. Candidates can download the application form from the official website of Mizoram Police is www.Police.Mizoram.gov.in. Candidates fill the application form with necessary information and send the application form to the address of DIG (Hqrs) Office, PHQ, Khatla, Aizawl, Mizoram on or before 25-10-2018 06:00 PM, along with and write on the top of the envelope: “Application for the Post of Constable (Exe.) (Male or Female) in Mizoram Police-2018. The last date for submit the application form is 25-10-2018. For more details candidates will check in the official notification.